A little bit of relaxing before the parade began. Pictured (L-to-R): James Knisley, Matt Stanley and Ben Streitenberger. Knisley is a student-teacher studying under Stanley. Stanley is the WHS band director and Streitenberger is the WMS band director. Some students needed to release a little excitement. Nobody knows what they were talking or laughing about except for themselves, but it appeared to work. Energy was high but consistent before and throughout the parade. 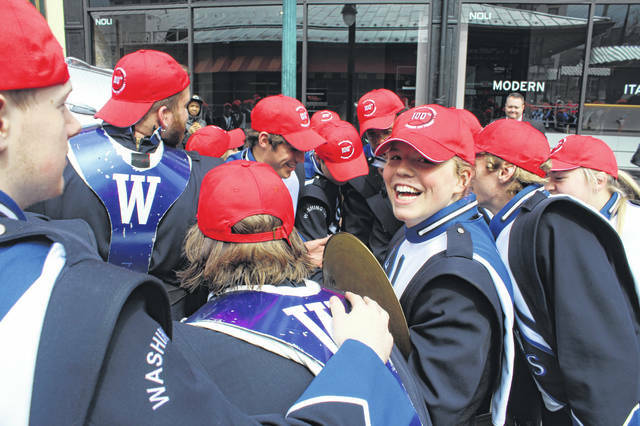 The Washington High School Blue Lion Marching Band had over 100 members march at the Cincinnati Reds Opening Day Parade in downtown Cincinnati. Although the weather switched from rainy to warm, the students held out with high energy that resulted in cheering crowds. A passerby stopped to chat with a few students. He explained nostalgia over the students’ shoes. The shoes reminded him of footware from when he was younger and from movies set in older times. Students were helping each other to get ready before the parade started. 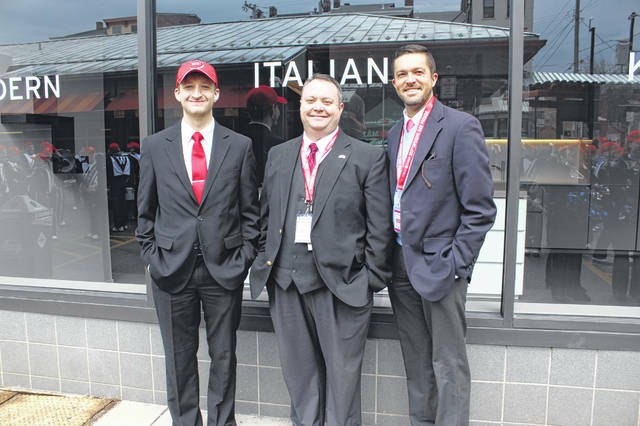 Pictured (L-to-R): Trevor Patton, Ben Streitenberger and James Knisley. Patton is the Director of Marketing and Communications at Washington Court House City Schools. Mascots were many and various prior to the start of the parade. Students took the chance to meet and pose with the Cincinnati Cyclones mascot. 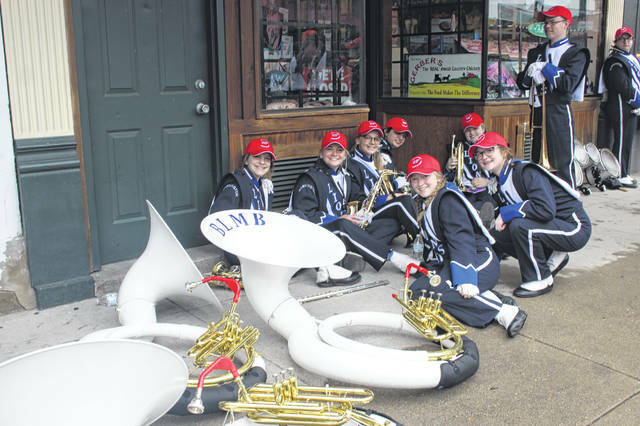 https://www.recordherald.com/wp-content/uploads/sites/27/2019/03/web1_IMG_2624.jpgA little bit of relaxing before the parade began. 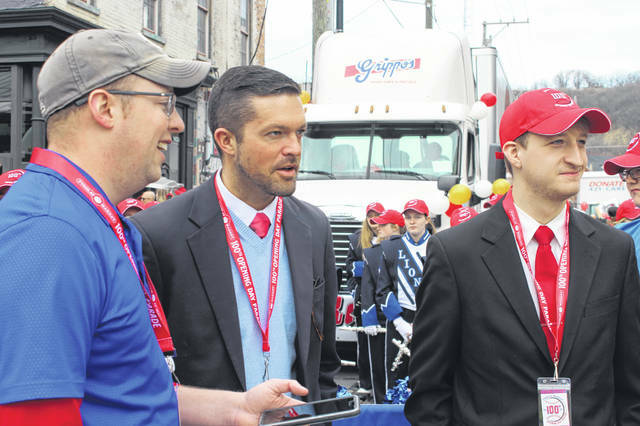 https://www.recordherald.com/wp-content/uploads/sites/27/2019/03/web1_IMG_2655.jpgPictured (L-to-R): James Knisley, Matt Stanley and Ben Streitenberger. Knisley is a student-teacher studying under Stanley. Stanley is the WHS band director and Streitenberger is the WMS band director. https://www.recordherald.com/wp-content/uploads/sites/27/2019/03/web1_IMG_2658.jpgSome students needed to release a little excitement. Nobody knows what they were talking or laughing about except for themselves, but it appeared to work. Energy was high but consistent before and throughout the parade. 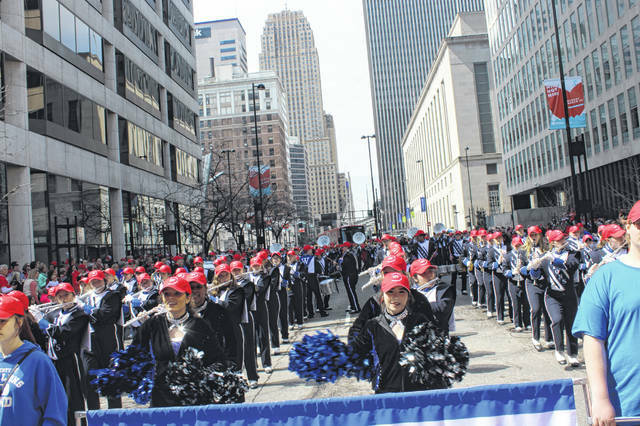 https://www.recordherald.com/wp-content/uploads/sites/27/2019/03/web1_IMG_2783.jpgThe Washington High School Blue Lion Marching Band had over 100 members march at the Cincinnati Reds Opening Day Parade in downtown Cincinnati. Although the weather switched from rainy to warm, the students held out with high energy that resulted in cheering crowds. 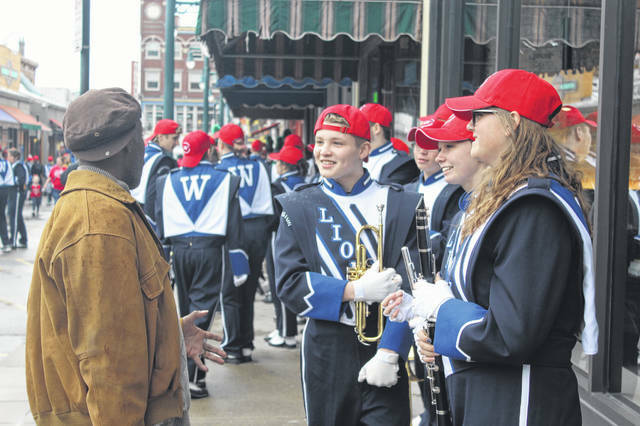 https://www.recordherald.com/wp-content/uploads/sites/27/2019/03/web1_drunk-guy.jpgA passerby stopped to chat with a few students. He explained nostalgia over the students’ shoes. The shoes reminded him of footware from when he was younger and from movies set in older times. 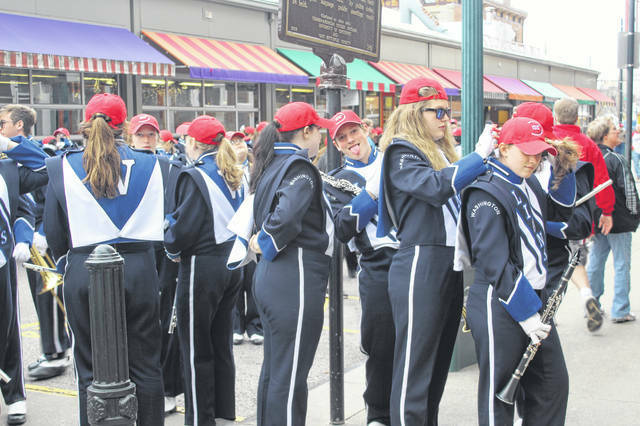 https://www.recordherald.com/wp-content/uploads/sites/27/2019/03/web1_IMG_2582.jpgStudents were helping each other to get ready before the parade started. https://www.recordherald.com/wp-content/uploads/sites/27/2019/03/web1_trio-of-st.jpgPictured (L-to-R): Trevor Patton, Ben Streitenberger and James Knisley. Patton is the Director of Marketing and Communications at Washington Court House City Schools. https://www.recordherald.com/wp-content/uploads/sites/27/2019/03/web1_mascot.jpgMascots were many and various prior to the start of the parade. 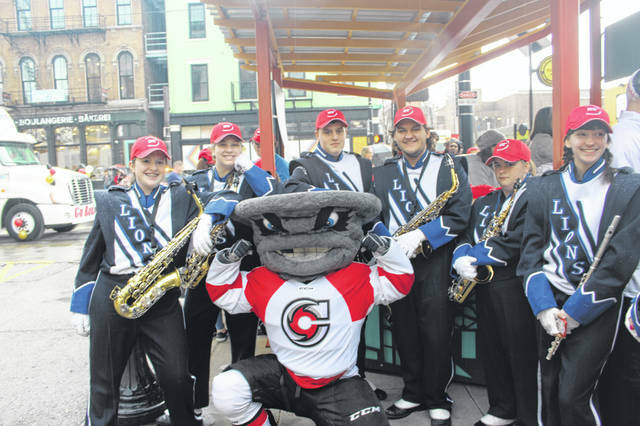 Students took the chance to meet and pose with the Cincinnati Cyclones mascot.